Thank you to the children at Selma F. Bartlett’s Elementary School for picking Seniors To The Rescue to be their non-profit organization to support with their year long Dollar Drive. Thank you to their teachers, Ms Shapiro, Ms Mac Lean, Ms Boyce, Ms Hensel, Ms McCall, Ms Powers and Ms Speiser for being a part of it. It was wonderful meeting all of them from kindergarten though 5th grade. I forgot how inquisitive children are. It was refreshing to start my day in such a positive way. The funds will be used to purchase items for our Boo-Boo Bag program. 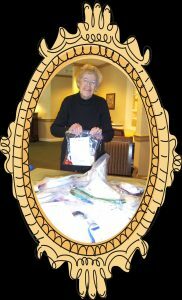 It was our very first project and will continue in the memory of my Mother, Terry, who was the inspiration for Seniors To The Rescue. Thank you Mom. Terry finishing our very first Boo-Boo Bag on March 30, 2013.